Making sure children are comfortable when visiting the dentist is an essential part of creating a lifetime habit of dental care. We recommend children start dental visits around their first birthday. But for some children this may not be enough — despite parents’ and dentists’ best efforts they may still develop an inordinate fear of dental visits and even routine procedures. This kind of anxiety could inhibit them now and later in life from receiving needed dental care. 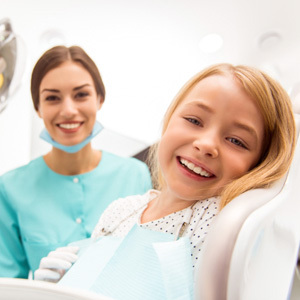 To relieve this anxiety, dentists have developed sedation therapy for children. Not to be confused with anesthesia, which numbs pain, sedation uses drugs to place a patient in a relaxed state. Depending on the drugs and dosage used, we’re able to achieve anywhere from a light state of relaxation to a deep suppression of consciousness. The approach is similar to one used with adults, although drug dosages and applications will differ with children. Â If we’re planning to use sedation with your child we recommend you feed them a low-fat dinner the night before and then refrain from any other foods or liquids until after treatment the next day.Â Just before the procedure (and after we’ve evaluated them physically to be sure they’re healthy enough for the sedation medication), we’ll administer the sedative, usually Midazolam and Hydroxyzine. Taken by mouth in a syrup form, this places them in a mildly relaxed state. During the procedure a designated staff member will continually monitor their pulse, breathing, blood pressure and other vital signs. We may also take other protective measures like special chair positioning or immobilization to keep movement to a minimum. After the procedure, your child will remain in the office until their vital signs return to pre-sedation levels. Once at home, you should keep an eye on them for the rest of the day. They should not return to school or regular activities until the next day. As sedation medication and techniques continue to advance, they’re becoming a routine part of dental care. If your child experiences anxiety, this can help make dental visits more pleasant and more likely to become part of their life from now on. So you’re tearing up the dance floor at a friend’s wedding, when all of a sudden one of your pals lands an accidental blow to your face — chipping out part of your front tooth, which lands right on the floorboards! Meanwhile, your wife (who is nine months pregnant) is expecting you home in one piece, and you may have to pose for a picture with the baby at any moment. What will you do now? Take a tip from Prince William of England. According to the British tabloid The Daily Mail, the future king found himself in just this situation in 2013. His solution: Pay a late-night visit to a discreet dentist and get it fixed up — then stay calm and carry on! Actually, dental emergencies of this type are fairly common. While nobody at the palace is saying exactly what was done for the damaged tooth, there are several ways to remedy this dental dilemma. If the broken part is relatively small, chances are the tooth can be repaired by bonding with composite resin. In this process, tooth-colored material is used to replace the damaged, chipped or discolored region. Composite resin is a super-strong mixture of plastic and glass components that not only looks quite natural, but bonds tightly to the natural tooth structure. Best of all, the bonding procedure can usually be accomplished in just one visit to the dental office — there’s no lab work involved. And while it won’t last forever, a bonded tooth should hold up well for at least several years with only routine dental care. If a larger piece of the tooth is broken off and recovered, it is sometimes possible to reattach it via bonding. However, for more serious damage — like a severely fractured or broken tooth — a crown (cap) may be required. In this restoration process, the entire visible portion of the tooth may be capped with a sturdy covering made of porcelain, gold, or porcelain fused to a gold metal alloy. A crown restoration is more involved than bonding. It begins with making a 3-D model of the damaged tooth and its neighbors. From this model, a tooth replica will be fabricated by a skilled technician; it will match the existing teeth closely and fit into the bite perfectly. Next, the damaged tooth will be prepared, and the crown will be securely attached to it. Crown restorations are strong, lifelike and permanent. You Don't Have to Live with a Gummy Smile. Here's How We Can Change it! Janet Jackson: Even pop stars get insecure about their smiles! Don't give up on Flossing! Diabetes and Oral Health: True or False? Actress Jennie Garth Shares Tips for Making Oral Health Fun!